From Maison Chanel on rue Cambon to Jean Paul Gaultier on rue Saint-Martin, the history of French fashion is often closely tied to those of Parisian addresses. 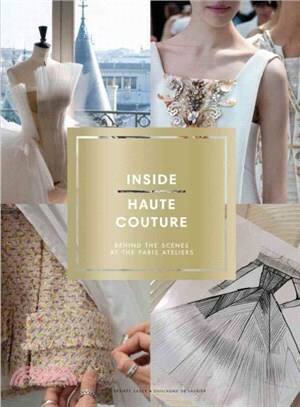 With exclusive photographs by Guillaume de Laubier and text by Desiree Sadek,Inside Haute Couture offers a private tour of 10 meccas of French fashion. From the splendor of VIP reception rooms to the privacy of sewing ateliers, the daily lives of the most renowned figures in haute couture are show-cased alongside the skilled artisans and their stunning creations. This book is an unprecedented journey into a world often closed to the public, against a backdrop of an exceptional architectural heritage. Desiree Sadek is the editor in chief of ELLE Oriental in Beirut. In 2014, Business of Fashion named her one of the 500 most influential fashion personalities in the world. Photographer Guillaume de Laubier has worked for prestigious decorating and lifestyle maga-zines for more than 25 years, and his work is featured in a number of books, includingThe Most Beautiful Libraries in the World.